A music theory book by Deana Dodds. Suitable as a first theory book. This book is a perfect resource for students beginning to learn to play the recorder. Works well alongside all recorder methods. The activities in this book are designed to complement the early stages of the teaching of the descant recorder. The book provides students with a written explanation of the basic concepts of music notation to reinforce what is being taught in practical classes.. The activities are designed to be engaging for the young learner, so that children will be eager to undertake the theory work that will enhance their practical learning. Many of these activities can be completed with little assistance – allowing the teacher to hear the playing of small groups or individuals while the class is consolidating its knowledge and basic concepts. The book provides regular assessment pages. You may ask your student to complete these without discussion and without looking at previous work. This will enable you do guage fully what has been totally understood by your students. A tick or similar mark on the assessment guide (at the bottom of the assessment pages) will encourage your students to continue their pursuit of accuracy. This book is the first in a series of Cool Cats Theory books. 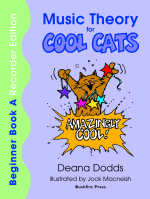 It is the entry point for young classroom recorder students and leads directly to Music Theory for Cool Cats Beginner Book B, which is the entry point into the series for students who are taking instrumental lessons on any treble clef instrument.